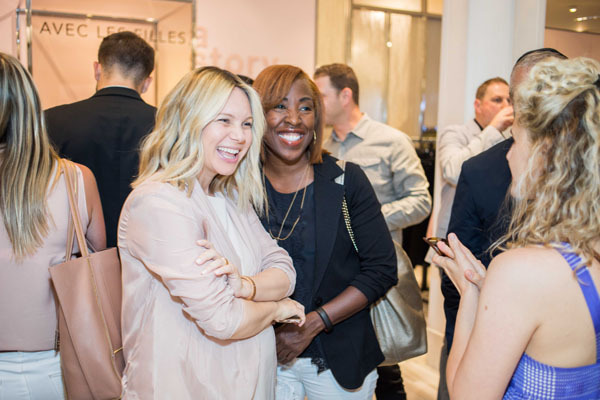 Yesterday evening, Macy’s welcomed design icon and founder of Avec Les Filles, Joyce Azria, in celebration of the opening of the new Avec Les Filles flagship shop at Macy’s Herald Square. Guests had the exclusive opportunity to mingle with Joyce while shopping the collection located on the fourth floor of Macy’s Herald Square. Attendees were also treated to light bites and cocktails, as well as an elegant ballet performance accompanied by a pianist who played the shop’s one-of-a-kind pink Steinway baby grand piano. Avec Les Filles, is a contemporary lifestyle brand created by Joyce Azria for the self-assured and stylish woman. French for “with the girls,” Avec Les Filles connects an achievable price point with aspirational design for a line that hits the millennial woman’s sartorial sweet spot. The new brand is Azria’s journey into the “dress code” of the inspired millennial, and aims to redefine how women express themselves and explore the world through the lens of fashion. The collection retails from $38 to $595, and is available at more than 150 Macy’s stores and on macys.com.